It was so funny hearing people’s reactions to my visit to Athens. Before arriving, I got every range of responses from fans and friends of “Oh my god, Athens is amazing!” to “Athens is the worst place in Europe”. It seems that people either love or hate Athens, there’s not a lot in between. Me? 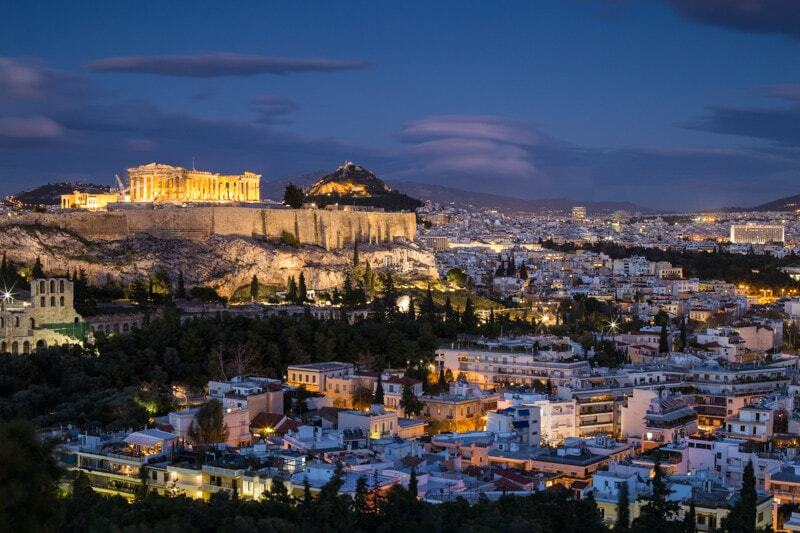 I crushed on Athens hard when I got there. I loved it. I thought the vibe was cool, the views were amazing, and the food options were outstanding. I guess I can understand the hate, though. There are loads of beggars, lots of shady individuals, and I saw more public urination and defecation in Athens than anywhere I’ve been not called China. But, yeah, I legit loved Athens. I thought it was fun. I thought it was exciting, and left a sense of youth and creation. I don’t know why, but I imagine this is what Berlin was like a decade ago. It just feels cool to me. I only had a couple days planned in Athens, so I wanted to make the most of them. There were two classic locations I really wanted to shoot. Then, I also wanted to capture a location that I found well wandering. I obviously couldn’t photograph every location in Athens in just 2 days, but I’m happy with what I got. I arrived in Athens really late, and still thought it was a good idea to hike up Mount Lycabettus before dawn the next day. I was exhausted when I woke up, but the views from up here were so good that it totally made it worth it. Really, there is nothing better than watching a city wake up from above it. The photos from up here were a bit of a challenge. I found it hard to capture how dramatic it felt. The light was also fairly flat on the sunrise I was up there, which made it more of a challenge. But still, a great place for sunrise. 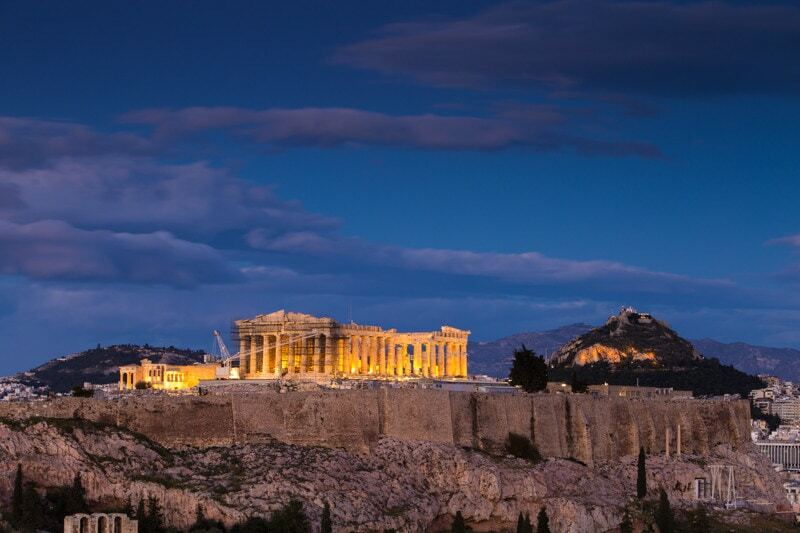 Telephoto images of the Acropolis. Up at Filopappou Hill I found a great view of the Acropolis for sunset. The sun was setting behind me, so as it hit the horizon it cast a nice soft golden glow on the ruins. I got absolutely fantastic light on this sunset shoot. My only issue was that there is so much scaffolding on the Acropolis it kind of kills the images. Still, this was some of the most fun I had shooting in a while. Such a cool location. 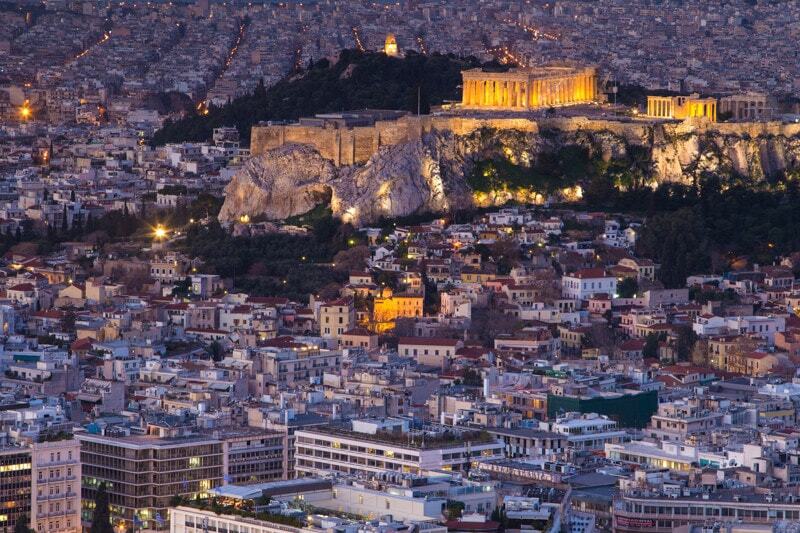 The Acropolis surrounded by the city. Blue hour from the hill. On my last available day of shooting, I wanted to capture something aside from the usual iconic shots of Athens. 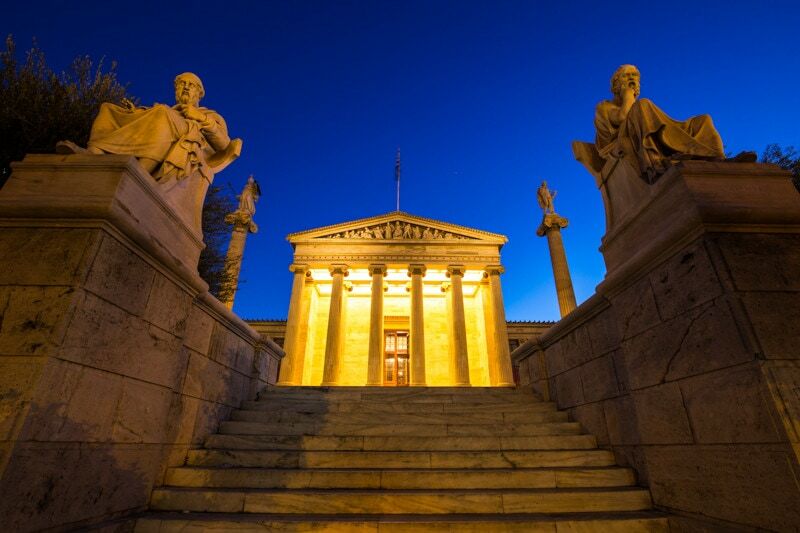 So I headed to the Academy of Athens for dawn and the morning blue hour. There wasn’t a cloud in the sky, which meant that my light came and went pretty quickly. However, the architecture here is very cool, and I got some photos that I’m definitely a fan of. It’s a great place to shoot before sunrise. I think if you came here in the afternoon or evening it would be too busy to get clean shots, though. 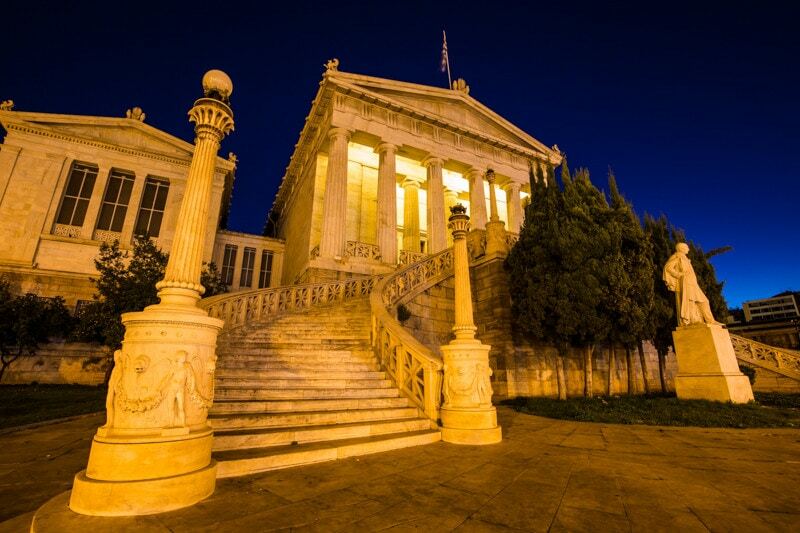 The Academy of Athens at dawn. Loved the architecture at the Academy of Athens. 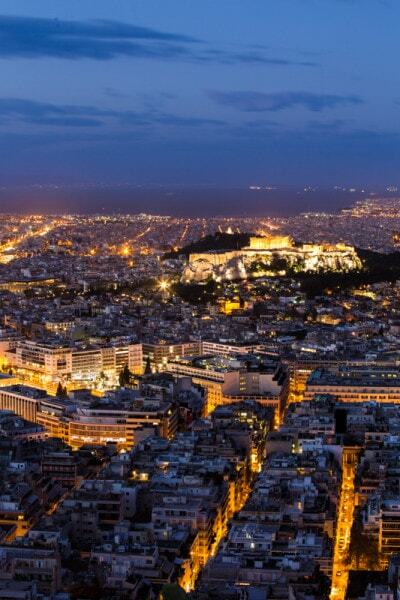 Will Athens be Included in a Photography Workshop? The chances are really high right now that we’ll be running a travel photography workshop in Italy and Greece in 2017. If you’re interested in joing that trip, be sure to head over to our workshop page and sign up for announcements regarding that trip. We’re still in the planning stages, but it looks like that trip will include highlights such as Athens, Santorini, Meteora, Cinque Terre, and Florence. Speaking of Meteora, Cinque Terre, and Florence, those are where my next articles are coming from. I’ll have a couple videos, and photography guides to those locations coming up soon. Glad you hiked up Filopappou Hill as it is my favourite view of Athens. However, I am in disbelief that the Parthenon is still covered in scaffolding like it was when I was there back in July 2007. That’s such a shame. 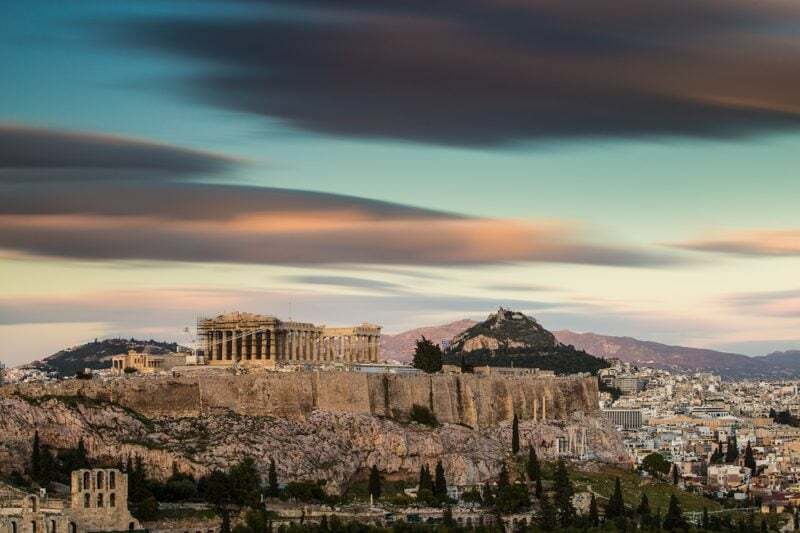 Glad you saw the beauty in it and loved Athens Brendan! People really do love it or hate it, I definitely fall in the former camp as it’s my former home and I’m hopelessly biased. It’s also a shame because the city is really suffering right now. 6-7 years ago, you would have hardly seen any beggars, shady individuals, or people publicly urinating. The awful economic crisis compounded by the refugee crisis now has led to this situation in the city; Athens wasn’t like that at all not too long ago.